I get a long, and unapologetic, reply from UKIP head office. I had complained about their local candidate in the recent county council elections: his specious claims about levels of immigration into rural areas and, in particular, the line “they seem to be breeding more than the natives” to describe migrants in a letter to me. The reply is from a man called Challice. It is full of the usual poison - the sort of stuff that you can find every day in the Daily Mail or on the Jeremy Vine show: scare-stories about Eastern European criminal gangs; the same old taproom casuistry and half-baked moans about Polish workers undercutting the indigenous population; no critique of the capitalist system that causes rampant and unchecked exploitation the world over; and no mention of the language his candidate used, which was the basis of my complaint in the first place. It is arrogant in tone: full of boasts about UKIP’s rise in popularity and concludes that if I do not like it, tough. The only point it does concede is that his candidate cannot write a coherent sentence. I take the dogs for a walk through the local orchards to compose my thoughts and a reply. 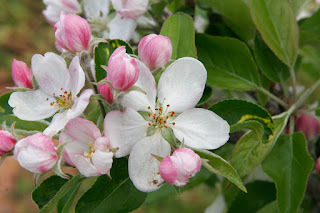 But it is blossom-time and, try as I might, I cannot focus on the bitter, rancorous notions of these uptight Little Englanders - they are at such a contrast to the beauty of the endless rows of white cherry and pink apple blossom. And, in the noonday sun, the overwhelmingly heady aroma of the blossoms makes any intention to write a lengthy response disappear. If UKIP have the time to write eight-paragraph emails, I do not: I have beetroot to plant. Perhaps I should not be so complacent. Perhaps in England we need to start following the example of the Scots in Edinburgh and let the Mosleyite Farage, and this other tribe of public school-educated bankers, know our feelings directly.